Shelobolina, E.C., Vrionis, H., Lovley, D.R. Novel approach to the recovery of environmentally relevant Geobacteraceae in pure culture; description of Geobacter uraniireducens sp.nov. (in preparation). Geobacter uraniumreducens Rf4 has been renamed to Geobacter uraniireducens Rf4 on or before12/17/07. Geobacter uraniireducens Rf4 is used in bioremediation. It reduces metals including uranium with acetate and other organic acids serving as the electron donor. Value and reason for sequencing the organism. Microbial Fe(III) reduction is often a key process during the natural or stimulated degradation of organic contaminants in groundwater and during uranium bioremediation in U(VI) contaminated sediments. That is why it is important to isolate and study the physiology of relevant dissimilatory iron-reducing microorganisms (DIRB) with 16S rDNA sequences matching sequences in 16S rDNA clone libraries derived from the same sample. An isolate, designated Geobacter uraniireducens strain Rf4, was recovered from sediments of the Old Rifle uranium bioremediation field site during the 2002 field trial (Anderson et al. 2003). Analysis of the 16S rDNA sequence of the strain Rf4 matched that of a 16S rDNA sequence repeatedly recovered from the uranium contaminated field site during stimulated bioremediation. G. uraniireducens is similar to the previously described Geobacter species in its ability to oxidize acetate with the reduction of metals. 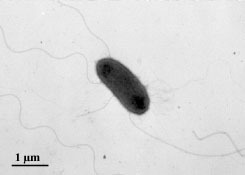 Unlike previously described Geobacter species, however, G. uraniireducens exhibits much slower growth rates and has 2-4 unusually long flagella (up to 16 µm). Anderson RT, Vrionis HA, Ortiz-Bernard I, Resch CT, Long PE, Dayvault R, Karp K, Marutzky S, Metzler DR, Peacock A, White DC, Lowe M, Lovley DR (2003) Stimulating the In Situ Activity of Geobacter Species to Remove Uranium from the Groundwater of a Uranium-Contaminated Aquifer. Appl. Environ. Microbiol. 69:5884-5891.